THE WINE INVESTORS, Corp. is a fine wine management firm headquartered in Panama with offices in Germany, Russia, USA and China. With our strategic partners in Bordeaux and extensive expertise and connections with the world’s most exclusive wine growers, wine traders and wine experts, THE WINE INVESTORS is always one step ahead of the competition. 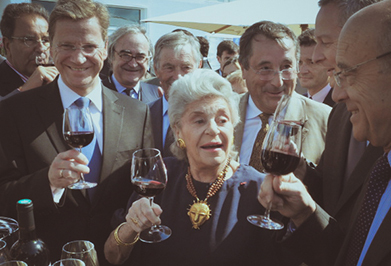 The company buys, manages and sells fine wine for investment and consumption purposes on behalf of the client, specializing in the most prestigious Grand Crus Classes Big 8 wines of Bordeaux, as well as select wines from some of the world’s premier wine regions in France, Italy, USA and others. Italy’s Sassicaia and Burgundy’s Romanée Conti are only some of the wines that are on the top of the world’s trading list. Many other wines offered in our daily updated portfolio are for both investment and for consumption. THE WINE INVESTORS offers a comprehensive array of brokerage and investment management services for investment grade wines. Our company acts on behalf of clients as a broker, making the best effort to purchase investment grade wines or fine wines for personal consumption, at the most competitive rates. We use proprietary software to track the rates of wines from the worlds most respected and reliable wine merchants, helping to ensure the best possible purchasing prices. Although most of our business is conducted on the secondary market, as this is where we believe our clients are most likely to achieve the best return on their investment, we also are constantly apprised of new opportunities to invest in En Primeur wines, where clients can buy “Wine Futures” in newly pressed vintages from Bordeaux and other exclusive regions. En Primeur investments can be higher risk, but also can deliver higher returns. Clients can receive different packages of service, depending on whether the client wishes to purchase wine as an investment, or for personal consumption. THE WINE INVESTORS buys and sells only the most sought-after wines from the most exclusive wine regions and we exercise exceptional diligence to uphold our clients’ expectations and maintain high confidence in the provenance and authenticity of every case and bottle. Each case of wine that we buy on behalf of our client is documented with a Validation- and History Report to give assurances and transparency as to its sales history. However, in the unlikely event that any of our services or brokered wines fails to meet your expectations, as outlined in our client service agreement and purchase order, including quantity, quality or description, please contact us and let us know the details of your dissatisfaction. We will make every reasonable effort to remedy the situation and ensure the same specification as ordered by the client. When you sign on as a client of THE WINE INVESTORS, you gain the expertise of our prestigious partnerships. With direct connections to the most influential and well-stocked wine merchants in the region of Bordeaux, THE WINE INVESTORS firm draws its extensive expertise from strategic partners and connections with the world’s most exclusive wine growers, wine traders, wine merchants, wineries, Chateaux and wine industry professionals worldwide. We help our clients find the right time to buy and sell investment grade wines, based on our knowledge of pricing trends, provenances and potentials for future ROI.